The Florida park that has it all! 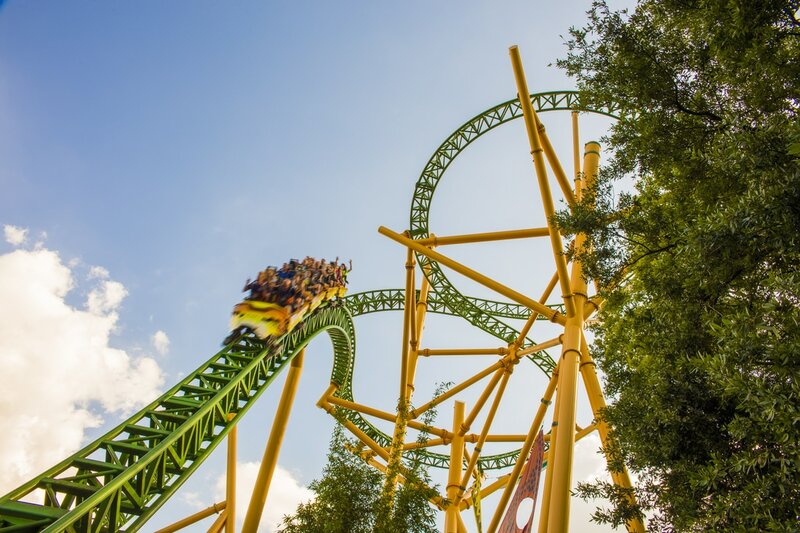 When it comes to theme parks in Florida, Busch Gardens has it all! This 330 acre theme park features the thrills and excitement of over 20 rides, an exotic zoo that's home to over 2,000 animals living in natural-style environments, and lush landscaping throughout the park. 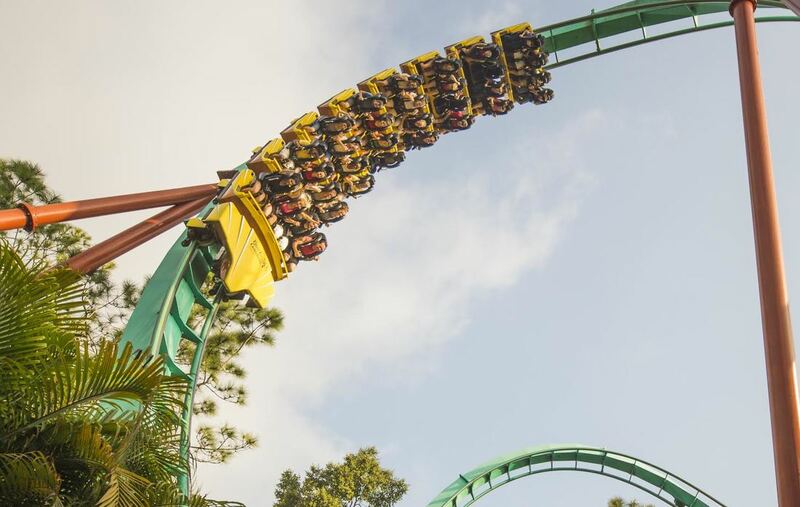 Busch Gardens is the first park to open up its exclusive Florida residential discounts to the public. So, if you wish to take your time exploring this adventurous zoological park, it may be in your best interest to purchase the seasonal pass and visit more than once! If you are staying in Tampa for a few days, take your time visiting the park and visit two sections of the park at a time. Plan your day so you come in the late afternoons, it’s less crowded and the sun isn’t as powerful. 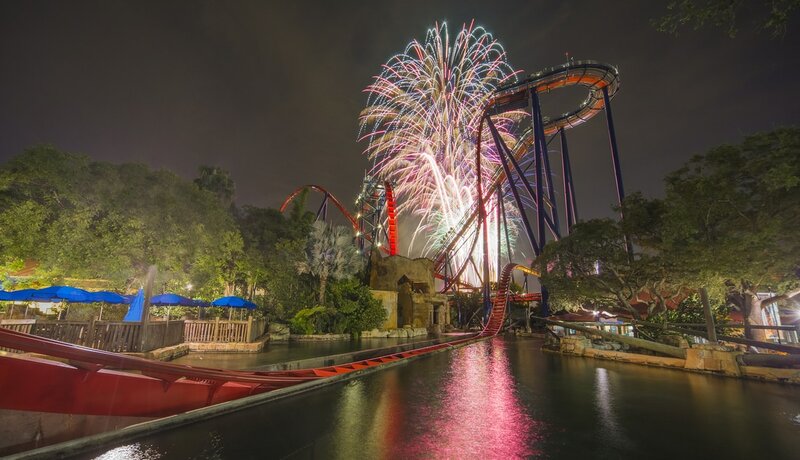 You’ll be just in time for the Kinetics light show that’s featured during the summer nights at 9:00 pm, followed by some exciting fireworks that your family will enjoy. Parking: If you have an accessible plate, sticker or hanging sign, you’ll be able to park in the accessible parking section, closest to the park entrance. 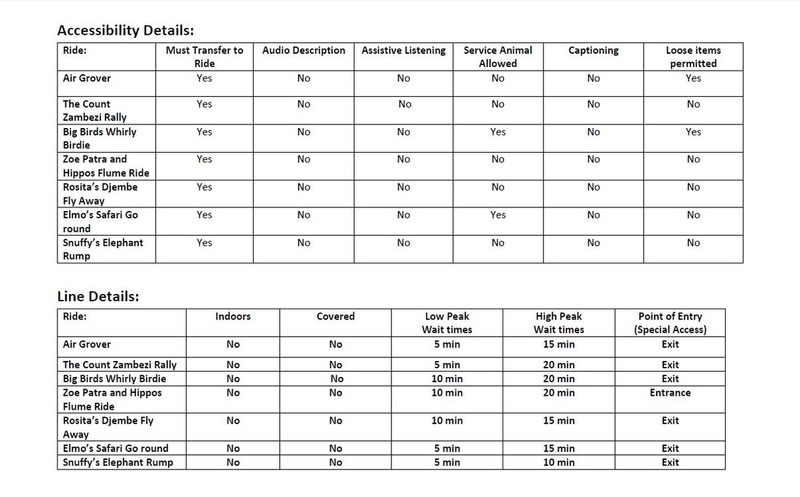 There is also the option of upgrading your ticket at the time of purchase to the premium type, which covers the cost of parking and additional charges for preferred parking. Bag Check: At the entrance, they’ll want to check your bag. Ordinarily, they won’t allow you to bring drinks, snacks or food into the theme park, but if your child is on a special diet (gluten, casein, organic, etc. ), they will allow it if you explain that your child has a disability and that the food you brought is specifically for them. This will only work if you have food fit for one and not the entire family. Special Access Pass: After you’ve passed the gate entrance, the guest services building is on your left. You’ll be able to obtain a “Special Access” pass for your child or individual with disabilities. 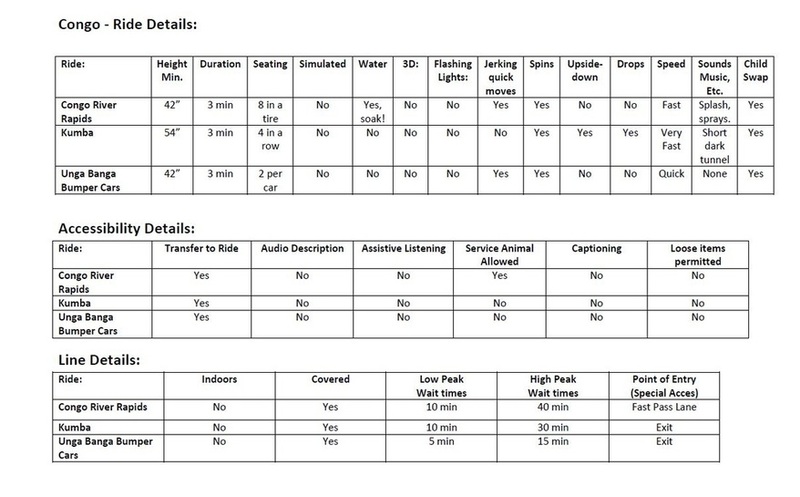 You’ll need to enroll your child into the “Ride Accessibility Program.” There are a few windows, but any of them can enroll you and give you a pass. One of the things I found to be impressive and different from most theme parks was the fact that once you were enrolled into the program, the information remains in their system. 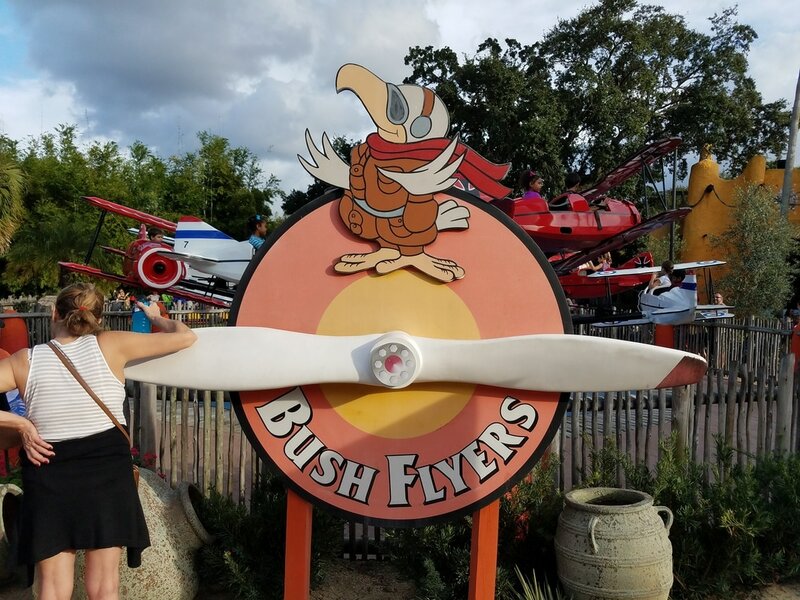 I hadn’t been to Busch Gardens since my son was about nine years old, yet three years later his information was still in the system, this made for a perfect time saver. This pass will not necessarily decrease your wait time for a ride, but it will definitely help make the wait more bearable. The rule is, if the ride wait is less than 30 minutes, you’ll be treated as a Fast-Pass rider (for rides that have it), or you’ll enter the ride through the exit side and wait for them to accommodate your party. Please be sure to ask a ride attendant to be certain you’re on the right line. My family and I didn’t know where to enter when we wanted to take the sky-ride across the park and ended up waiting on the regular line. It wasn’t too long and thank goodness our son was having a good day, but that won’t be the case every time. We found an attendant later and learned that we should have just come through the exit side. If the wait time is longer than 30 minutes, let's say it's 90 minutes. Then you'll be given a return time (90 minutes from the time you arrived), and when you return you'll be treated as a fast-pass rider or enter through the exit side. 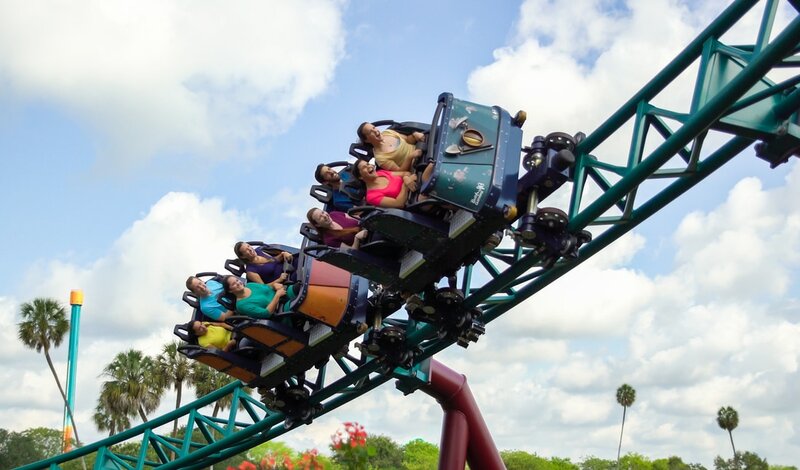 Helpful tips: Busch Gardens is a Tampa Bay theme park gem that will not disappoint your family. There are many activities, shows, attractions, and entertainment for everyone. Plan your trip in advance and review the theme park map together as a family. The Busch Gardens site updates their park hours, show times, and ride updates regularly. For information on this, click here: Show times and Ride updates. 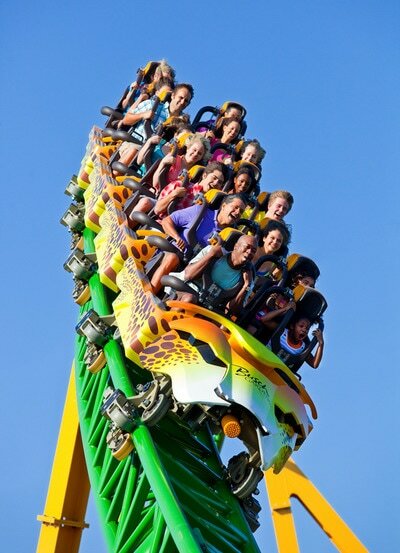 You can also print a map of the park and plan the day as a family: Busch Gardens Map. - Sesame Street – right behind the “Sunny Day” Theatre. - Stanleyville – in between the train station and the Zambia Smokehouse. - Congo – behind the Ubanga Banga bumper cars. - Pantopia (formerly known as Timbuktu) – in between the Desert Grill Restaurant and the Scorpion ride. - Nairobe – behind the Serengeti Outpost. - Egypt – a few steps away from the Montu gift shop. Tour the Mayombi reserve, you’ll find gorillas and chimpanzees living and playing in their world as you walk along misty paths. ​Gwazi Gliders - This will be most likely be the only place you’ll allow your child to hand-glide! This fun and safe ride is meant for kids and some pre-teens. These colorful gliders seat two children at a time. There is a lap bar to keep kids secure, but you'll only find smiles on kids’ faces as the glider rises up and then down on this circular ride! ​My boys are too big for this ride, but there was a day when this one was an all-time favorite! Every day is a sunny day as this place is dedicated to young children eight years old and younger. There are no fast pass entrances in this section of the park, so you’ll need to enter through the exit (if the wait is unusually long) and show your pass to the ride attendant. The rides are typically very short, I don’t think we’ve ever seen a line exceed twenty minutes. There were times we didn’t need to use the pass because the lines were just so short. 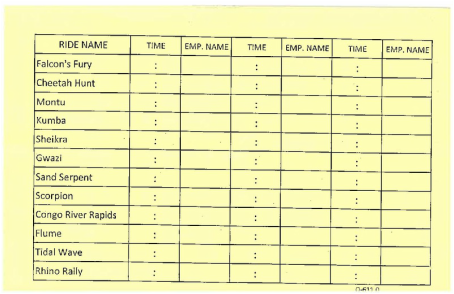 Although, during peak season you may need to use it. Air Grover - is a quick and fun coaster ride for kids that are first timers! It’s a fun and short coaster that parents can ride with their child. The Count Zambezi Rally – a slow moving car track ride of fun for pre-schoolers only – adults can’t ride this one. Big Birds Whirly Birdie – It’s Big Bird's Ferris wheel ride! The colorful cracked egg shells are big enough for parents to ride with their child. Zoe Patra & Hippos Flume Ride – a slow moving, splashy, water flume ride for pre-schoolers. Kids don’t really get wet on this fun ride. Parents won’t be able to ride this fun one! Rosita’s Djembe Fly Away – If your child loves to swing then they’ll love this gentle single swing ride. It’s slow moving and lifts off a few feet from the ground, so it’s not scary for little ones. Sorry, mom and dad, this one’s just for kids! Elmo’s Safari Go Round – A classic merry-go-round that moves gently while children ride on safari animals. This ride generally seats single riders, but more than one child may be able to ride together, depending on the animal they choose. 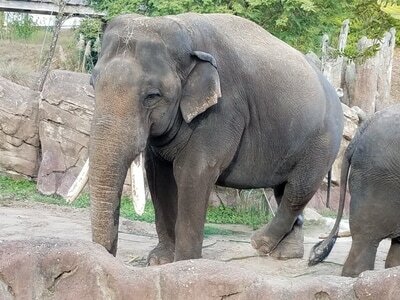 ​Adults may ride with their child, but will most likely be standing alongside their chosen safari animal. Snuffy’s Elephant Romp – Soar high above the jungle on this gentle ride of elephants! Adults may ride with their child on this fun ride. Tip: Unless you have no plans to explore the entire park, you may want to leave this section for last if your child loves to play in water (there’s a fun spray-ground that kids love) and you wish to avoid a possible melt-down. Take a stroll along a path rich in foliage and pass the pink flamingos wading in the lagoons, taking a break from the heat. You’ll see several exotic bird species, and you won’t want to pass up feeding the wallabies and kangaroos! This area of the park is usually the least crowded. Named after a city along the Congo River, this is where you want to be if your desire is to get soaked! Here you’ll find two water flume rides! Now, if you’re not one who likes water rides, but you still want to cool down, there’s a spot on the bridge that gets a direct hit from Shiekra’s splash! Tip: if your child is anything like my son, they may not want to walk around in wet clothing or squishing around in their sneakers for the rest of the day. Remember to bring a change of clothes and sandals for this section of the park. Sheikra – Your feet will be dangling on this floorless extreme ride! This ride will take you 200 ft high and then dangle you face down so you’re looking straight down at the drop your about to make. Then, doing 70 mph, it takes you on twists and turns, (this ride does go upside down) and travels into a dark short tunnel for just a few seconds. 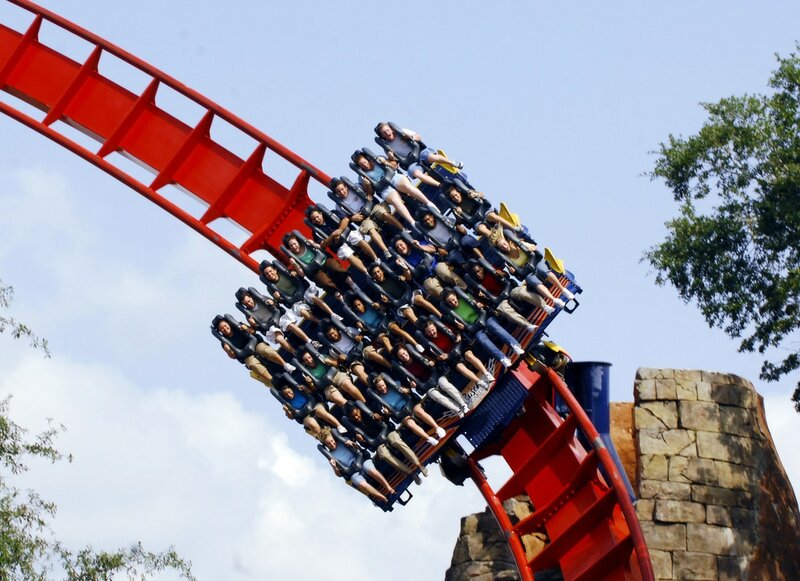 This coaster has an over the shoulder harness, and seats eight people per row. You’ll most likely need a return time for this ride as the wait time for this one is usually 60 minutes during peak season. ​This ride is truly a park favorite. The first time I rode it, I couldn't talk for a few seconds!!! If you're a true thrill-seeker, this is the ride for you. Stanley Falls Flume – If you and your kids love to get wet, then this ride is a fun find. Each log may fit up to three people (sitting behind one another). Like most log rides, there’s no back support and the bench you sit on is usually wet. It’s a pretty easy going ride with amazing views of the park. Watch out for that last drop though, you will get wet! During the summer months, there’s usually a long wait of 60 minutes or more, you’ll most likely need to get a return time for this one. Tanganyika Tidal Wave – 2017 Update: This ride is no longer open. This is another log flume favorite! You won’t just get wet on this ride, you’ll be completely soaked! Five people sit in each row for this 5 minute ride. There is a long, pull-down lap bar that locks in place to secure all five passengers. The ride starts off with a leisurely tour of the villages in the jungle. After a few minutes, it transforms into the more familiar flume ride you’ve come to know-as you climb up the rail for that famous drop! 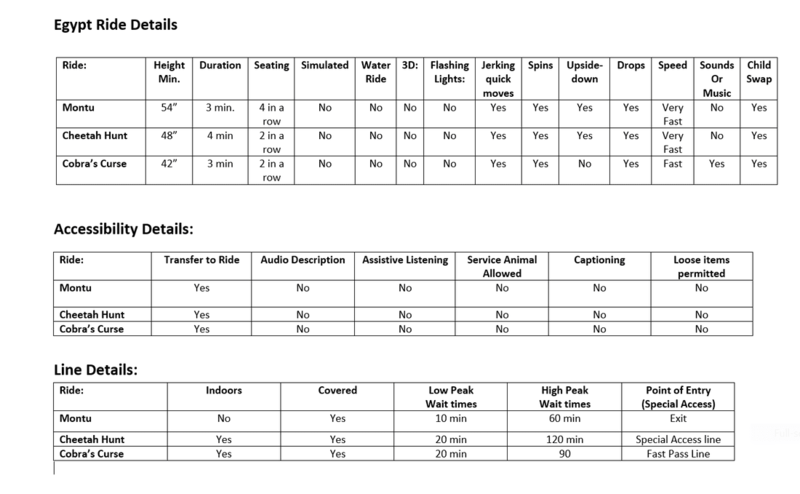 Make sure you have no electronics with you on this ride, everything will get wet! Stanleyville Train Station – If at any time you need to get off your feet, take a ride around the park on a fun train ride. You’ll stop at Nairobi, Congo or come full circle back to your station in Stanleyville! 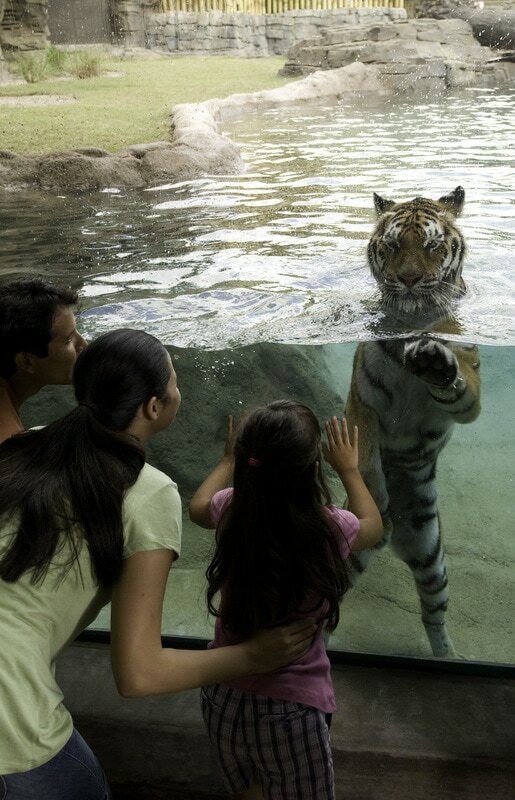 Enjoy the beauty of the exotic Bengali Tigers and Orangutan exhibits. Treetop Trails – This is a zip-line type of ride that takes you high above Jungala. 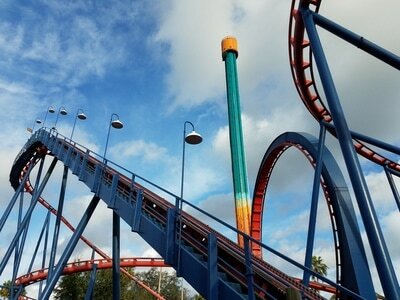 It’s a fun ride for those who aren’t afraid of heights, and it’s a single flyer ride. For children who understand the importance of remaining still and calm, it’s a fun and great quick ride – less than a minute long. 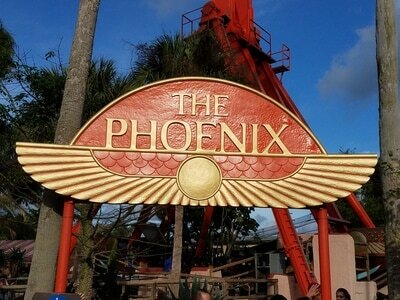 Tip: I went on this ride about four years ago with my Autistic son, my husband insisted he would enjoy it. He was about eight years old at the time. 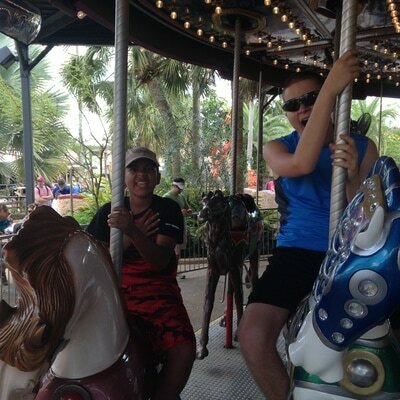 The ride is like a swing seat, and at that time, the only safety feature was just a belt that sat across his lap, there was a strap in between in legs, however, it was loose and he could easily slip out of it if he wanted to (he was younger and smaller). The ride was less than a minute long as it zipped quickly across and down, so my anxiety was over in seconds. 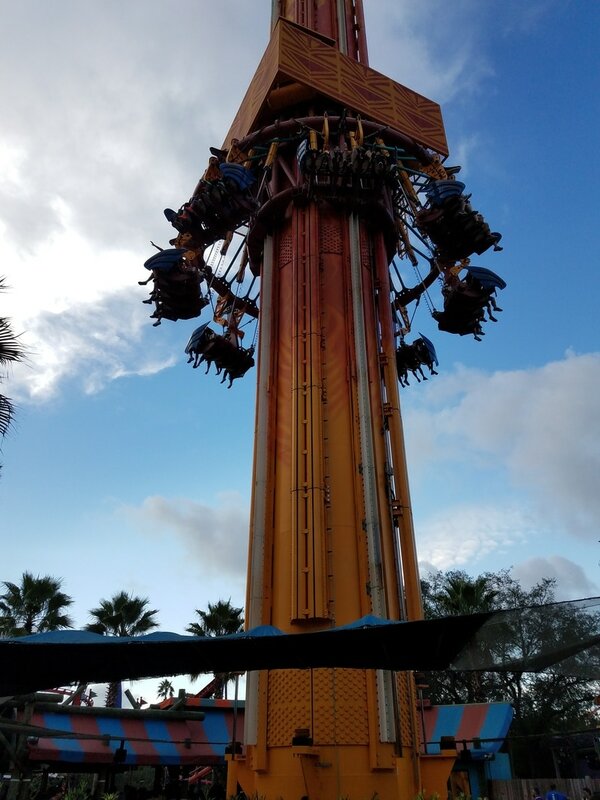 However, my husband and then four year old step-son, went on the ride moments after we did and got stuck on the ride in mid-air for fifteen minutes. I honestly don’t know if my son would have known to remain calm and still while being suspended on a non-eventful ride for so long. I learned to trust my instincts from then on and never put him on any ride that causes me to question safety issues. 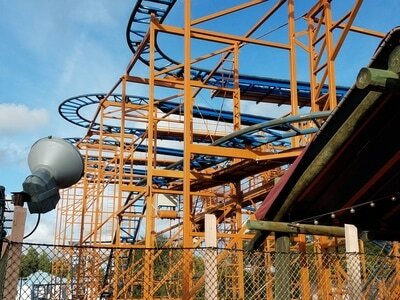 The Wild Surge – This ride is for thrill seekers between the ages of about 6 and 13 years old. Riders should have a minimum height of 42” and a maximum height of 48.” This free fall ride has an over the shoulder harness with a belt that snaps from the harness to a buckle in-between your knees, seats 7 straight across and takes the kids up and down in quick fun movements. Tip: I know it’s hard when people begin to pressure you into believing your child will love a ride. From time to time, you may hear things like, “Let him try new things,” or, “You baby her too much.” No one knows your child better than you do. Always trust your instincts. 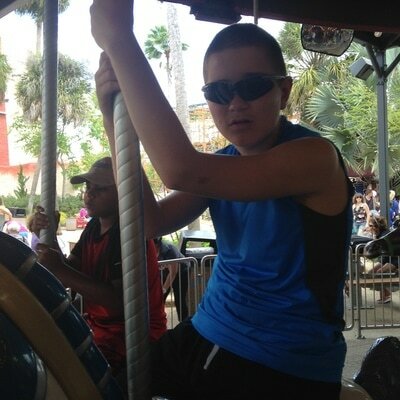 If you only wish to allow your child to go on rides where he or she can be accompanied by yourself or other trusted adult/family member, by all means stick to your rule. If you know your child’s likes, dislikes, and fears, and you feel a certain ride will displease him or her, again, make no exceptions and stick to your rule. This section of the park is home of the famous Congo River Rapids and the classic coaster “Kumba. Congo River Rapids – This is the ride to go on if you want to cool off from the sun’s hot rays. If the wait is less than 30 minutes, you’ll go through the fast pass line, otherwise, you’ll be given a return time that matches the lines wait time. The ride seats twelve at a time with a short gap between every two seats. All passengers have to secure themselves with a lap-belt that clips on like an adjustable airplane seat-belt (some riders may need help with adjusting and securing their belts). Be sure to put your things in the locker, you will get soaked! This tire shaped ride takes you down the river rapids, teasing all passengers, as it spins and bumps you around, not knowing which of you will get the big splash! Watch out for the folks on the bridge waiting to squirt you - there equipped with state-of-the-art water guns, and some how they all seem to know how to hit their target. They never miss me anyway! Kumba – This extreme, over the shoulder harness, roller coaster offers a smooth ride that glides into dips, loops, twists and turns! Beware of some slight head-banging and a short, dark tunnel that the coaster speeds through. 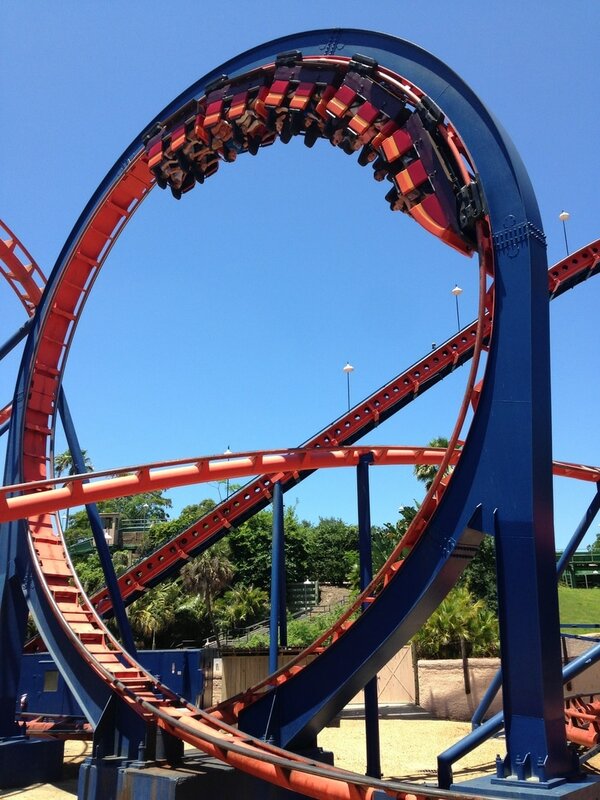 This is a classic Busch Gardens coaster and it’s an all-time favorite. Ubanga Banga Bumper Cars – An American classic for carnivals and fairs, but many might consider the bumper cars to be an easy break from the extreme roller coaster rush. The lines are never long on this nostalgic ride. Being mom, I’m always targeted by my husband and kids, so I spend most of the ride trying to get away from them. Congo Train Station -If at any time you need to get off your feet, take a ride around the park on a fun train ride. You’ll stop at Stanleyville, Nairobi, or come full circle back to Congo! Grand Caravan Carousel – The classic Merry-Go-Round is always a treat for every one of all ages. 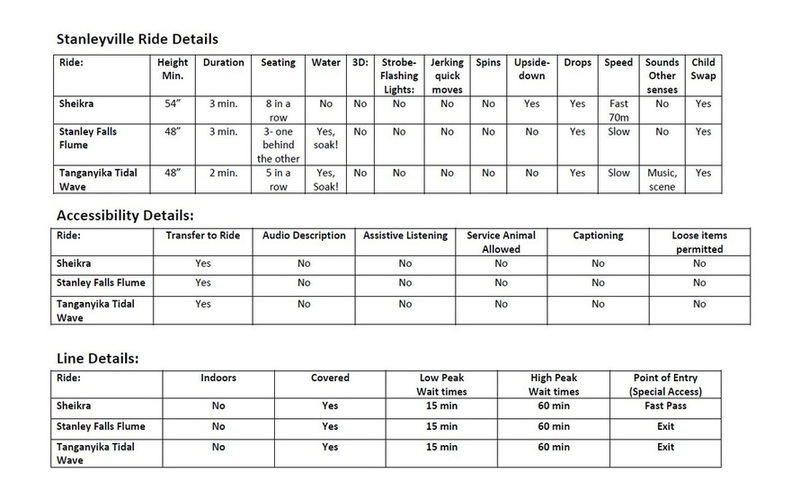 Quickly choose between riding the legendary Arabian horse or the ancient, dependable Arabian camel. Maybe you just wish to relax by sitting on one of the still chariots? Whether you want to go up and down or can find an animal that stays grounded to the floor, everyone will enjoy riding this classic ride. Busch Flyers – Take off on a two seater-plane that soars up and down as you go round and round! Sand Serpent – This is one of my kids’ favorites (mostly because they enjoy hearing me shriek in fear of those sharp turns!). 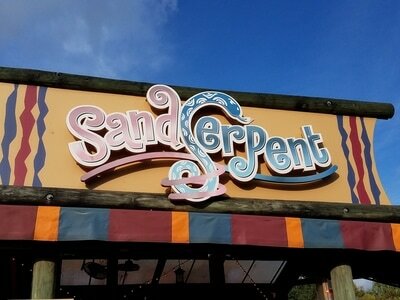 Formerly known as “Cheetah Chase,” this ride is a fun coaster that provides the thrilled illusion of heading towards the end of the track – then in a flash, you turn sharply to the right or left! Phoenix – You won’t want to have your phone, keys, or loose change in your pockets when you board this boat swinging ride! The boat swings back and forth, swaying further and further until you’re held suspended upside- down for several seconds. Beware: my two nieces and stepson (ages: 16, 12 and 9) each complained the overhead harness was way too tight, and the seats were small and too close to one another. They each agreed the ride was very uncomfortable. 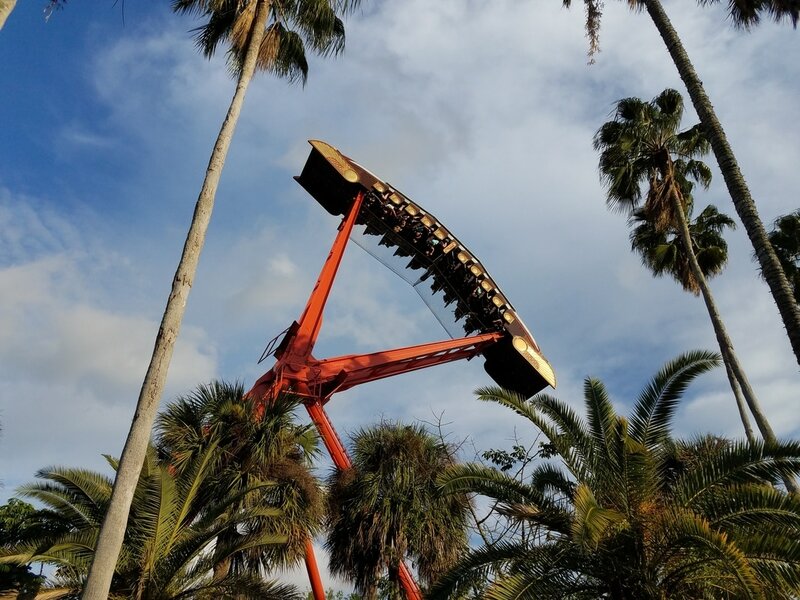 Scorpion – This coaster’s momentum will take you quickly through a single upside-down loop and several twists, dips, and spiral loops to the end. 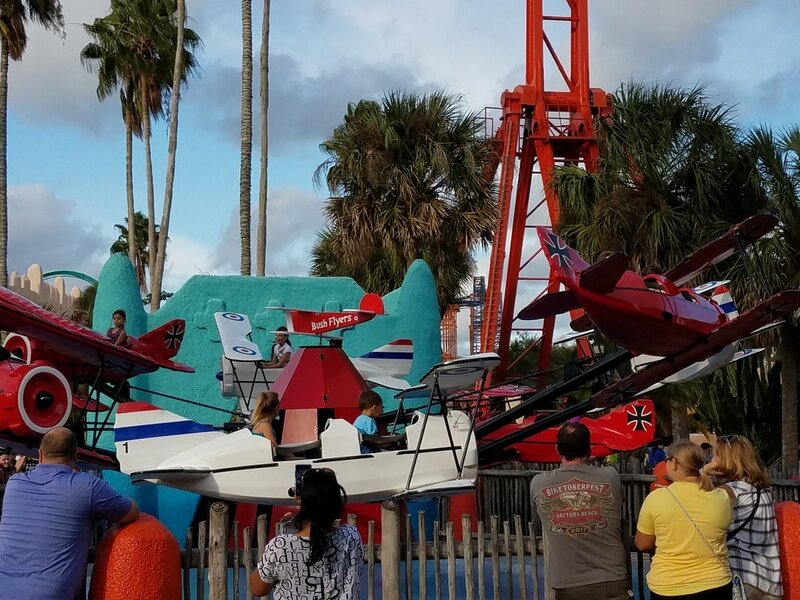 It’s a quick ride, but it’s a kid favorite! Desert Runners – 2017 Update: This ride is no longer available.A kiddie carousel with an alternative twist – ride motorcycles instead of horses! 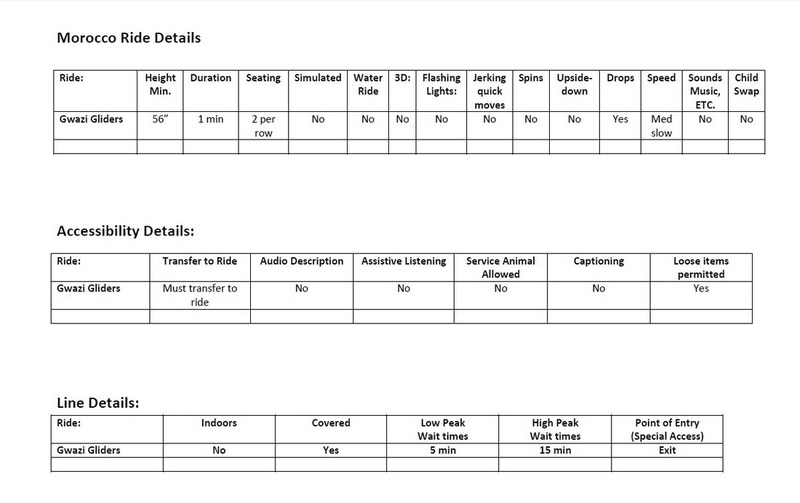 Kiddie Train – 2017 Update: This ride is no longer available. Pre-schoolers will love this short, slow-moving train ride. Serengeti Railway Steam Train – The best way to take a break from the heat and rest your feet, would be to ride the train across the Serengeti! Take a nice ride across the park, relax and enjoy the gorgeous lush views of Giraffes, Gazelles, Deer, Elephants, and other beautiful animals playing, hazing, or grazing in there amazingly seemingly natural habitats. This train also stops at Congo and Stanleyville. Sky Ride – Another way to take a break from the crowds and heat, if you’re not afraid of heights, is to enjoy the slow sight-seeing adventure of the sky ride. My family of four has to ride two at a time, so Richie and I usually take the first car while my husband and step-son follow. Relax and get the birds eye view of this amazing park. ​* If you're into photography, there are some great angles of the some of your favorite attractions, so keep your camera ready too! This ride also gives you the opportunity to notice things you might have missed while you were walking! At the edge of Africa, you’ll find many beautiful animals to check out. Lemurs, zebra’s, giraffes, and other exotic safari animals can be found in this section of the park. 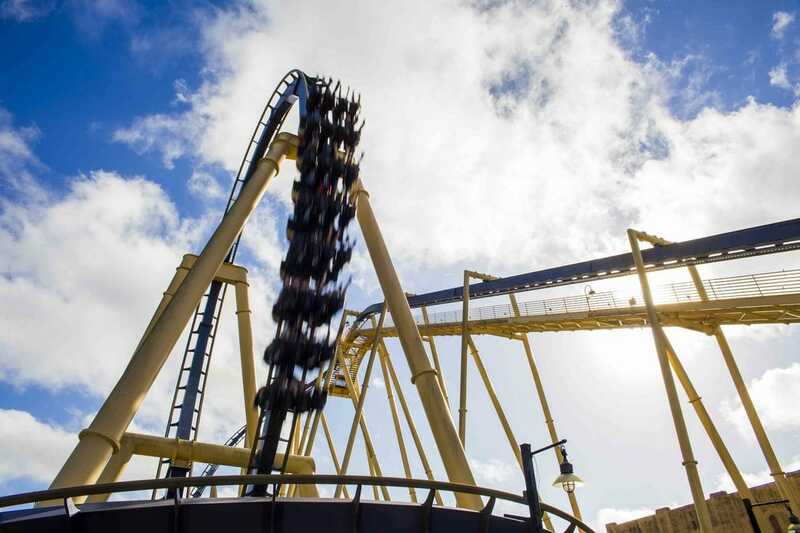 Montu - This ride is an all-time favorite for many coaster lovers, it’s one of mine too. 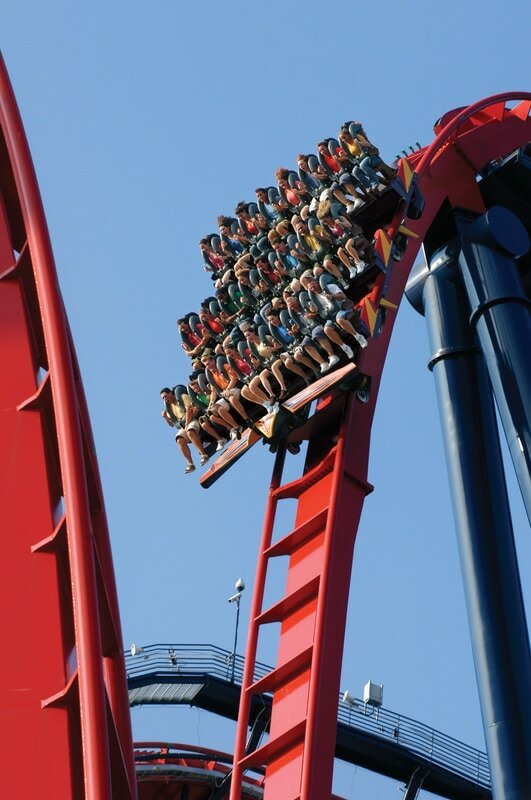 This inverted coaster has an over the shoulder harness, and is one of the smoothest rides. Your feet are dangling on this ride, so make sure you have no phones, or important items in your pockets. 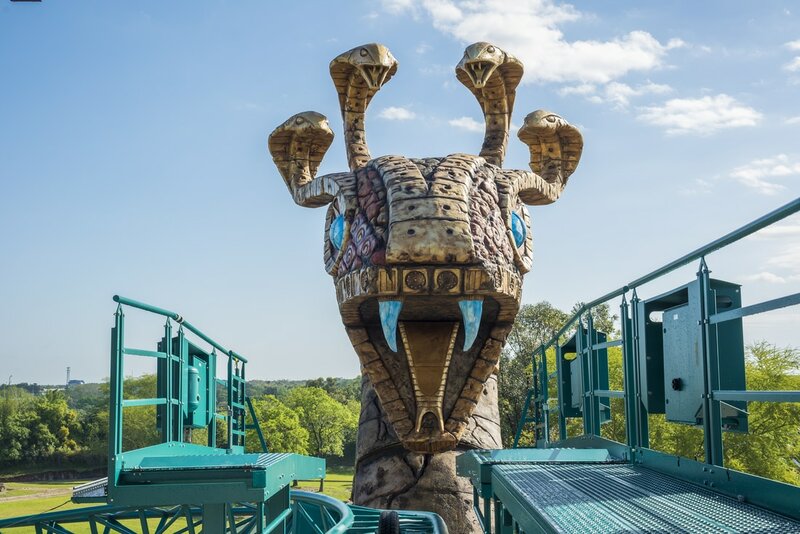 Cobra's Curse - The parks newest member of the fun-coaster rides has arrived! This ride quickly became Richie's new favorite. We went during the holiday break, so peak season wait times were at an all-time high. Our wait was for thirty minutes, it wasn’t too bad. However, for kids who have trouble with waiting, I’d wait until later in the day or the evening to ride it. The train moves continuously alongside a moving platform, but riders who use wheelchairs can request for the platform and train to stop long enough for them to get in. I’ve also seen stationary trains parked on a different track beside the platform for accommodating guests who need to move directly from their wheelchair onto the ride. Once the lap bar locks you in, your adventure begins! 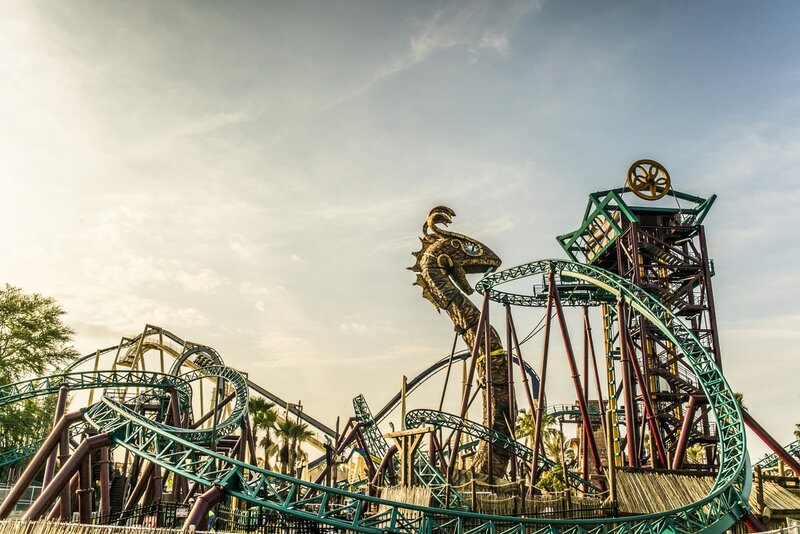 This one-of-a-kind family coaster starts with a unique elevator lift that brings you face-to-face with the Cobra. Then your first drop leads you into spinning forward, backward, vertically, with dips and turns in-between! I loved the ride. Richie and I laughed the whole time! Cheetah Hunt - No ride has ever become a favorite faster than this one! This three-minute, over the shoulder harness, speedy coaster ride extends into other areas of the park, as you twist, loop, soar over the park, and take on weightless dips. There are three launches through-out the ride that intensify the speed, and unlike other coasters, there is no head-banging. You are seated comfortably throughout the ride. 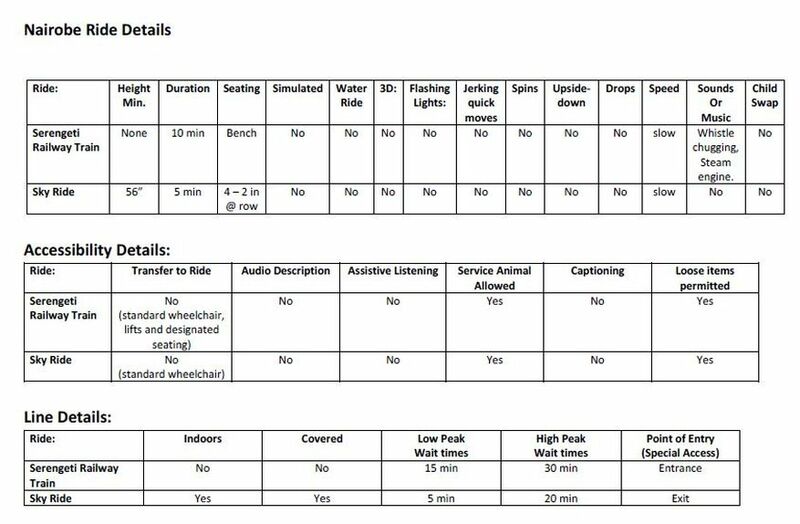 For more information on all the rides and information about their accessibility, please click here: Rides that are accessible friendly. 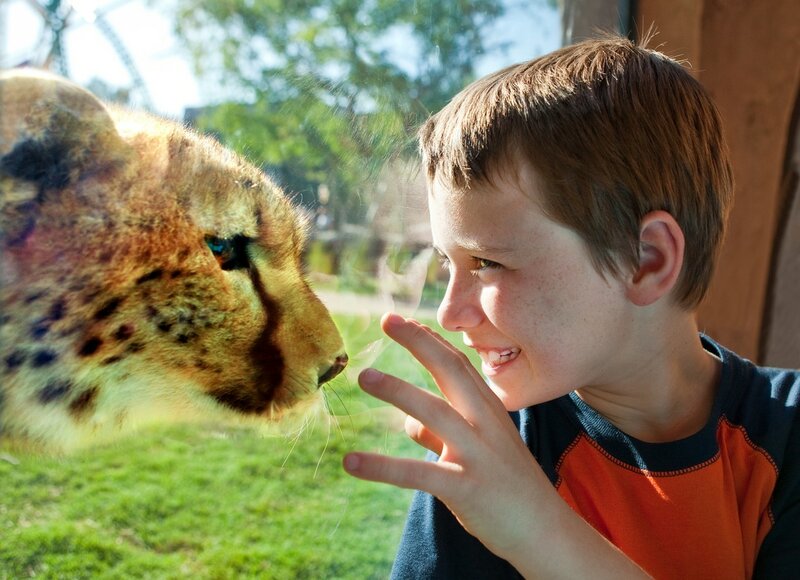 For the official Busch Gardens disability guide, please click here: Busch Gardens Accessibility Guide. Visit Busch Gardens website and begin planning your vacation!